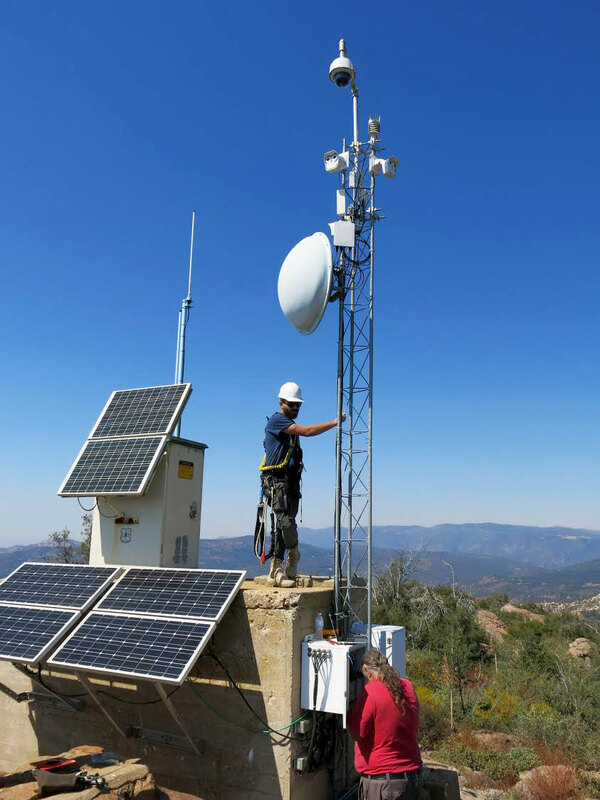 HPWREN, in collaboration with San Diego Gas and Electric (SDG&E), as well as the University of Nevada Reno (UNR), has begun to add cameras with optical zoom capability to its vast network of environment-observing cameras. This October 2017 video shows an informal interview with Pablo Bryant, Reserve Manager for San Diego State University's Santa Margarita Ecological Reserve and Sky Oaks Biological Field Station, showing some aspects of HPWREN collaborations. What does it look like being on a mountain top engulfed by fire? 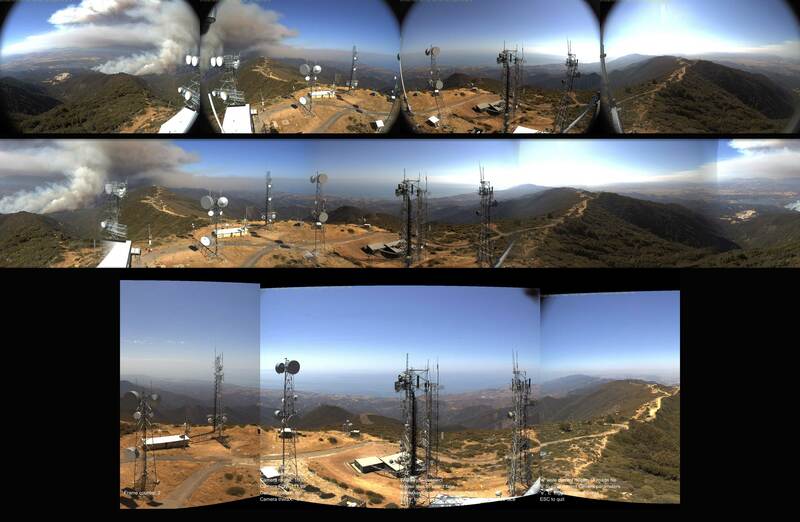 This article, contributed by Paul Bourke, shows an immersive time-lapse animation of a four-camera 360 degree view in high resolution of the Whittier Fire near Santa Barbara in July 2017, projected onto the inside of a sphere, within which a viewer can pan, tilt and zoom. Viewing options include a PC with a mouse to control rotations (best in full screen mode), a tablet or smart phone that reacts to viewer movements, or a virtual reality head mounted display able to track head tilt and rotation. 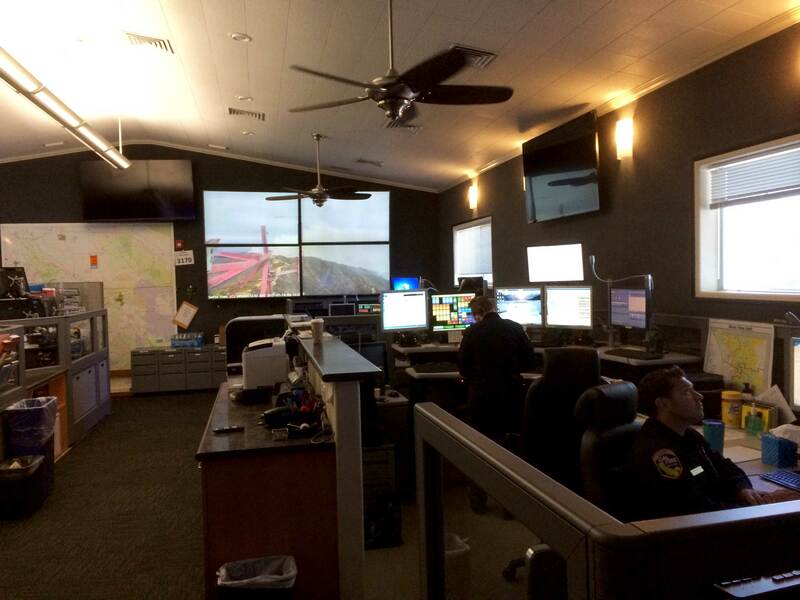 Staff of HPWREN regularly consider how we might make our collected data more useful for our user community (which is predominately in the Scientific Research and Public Safety arenas). We request user feedback through our web pages and ask at many opportunities how we might improve the packaging or presentation of our existing data, or what new data might we be in a position to provide. This year we have made improvements to both. The close juxtaposition of the ocean and the mountains in Santa Barbara makes for beautiful views - but when it comes to wildfires, it can also spell danger. In the past decade, the area has experienced seven major fires on both sides of the Santa Ynez Mountains, including the Whittier fire that started July 8. HPWREN has joined the Social Media World! The main HPWREN web site is still the place to go for detailed and historical information, yet we want to increase our Internet presence. As such, we intend to post weekly updates with pictures and videos, connect with peer sites and share content that HPWREN users and the public may care about.